Paul Pietsch was born on 20 June 1911. Working at his mother's brewery did not interest the young German. He much preferred cars and in 1932 at an age of 20 he bought the German top driver Heinrich Joachim von Morgen's Bugatti T35 and started racing. The next year he changed to a Alfa Romeo Monza and entered it, amongst other races, in the 1933 French GP. The car was later rebuilt to a 2.6 litre with monoposto body. In February 1934 he went ice racing in Sweden and Norway, winning Vallentunaloppet north of Stockholm and in May he finished second in the Finnish GP. He was the top privateer at the Eifel GP finishing 4th before having a bad crash at a mountainclimb race and broke his leg. He was approached by both Mercedes and Auto Union for the 1935 season and chose the latter. On 24 October 1934 he participated in the Auto Union test drives at Nürburgring, and with his GP experience he not unexpectedly proved to be the fastest of the participants. So Pietsch and Rosemeyer were selected for the 1935 season. The rear engined Auto Union proved hard to drive and the season wasn't too successful for Pietsch, a 6th position at the Eifel GP and a shared 3rd place at the Italian GP with Rosemeyer were his best results. Pietsch did not get on well with team manager Willy Walb either and then in September Pietsch had to divorce his wife Ilse who had fallen in love with Achille Varzi, a situation that further poisoned the season. (Alfred Neubauer gives that story in his biography, using the aliases "Peter Paulsen" and "Lil".) So it is no wonder that Pietsch left GP racing in 1936 and concentrated on business instead. But in 1937 he was back in Lazro Hartmann's really troublesome old Maserati 6C-34. He was not even allowed to start in the Monaco GP as the car as usual was leaking oil. Pietsch finally destroyed the car at the Masaryk GP at Brno. In 1938 he raced a Maserati 6CM in voiturette races both as a works driver and as a privateer, his best result being a second place at the Coppa Acerbo. He continued racing voiturettes in 1939 but for the German GP he was included in the Maserati works GP team to race the Maserati 8CTF. Maserati had abandoned Grand Prix racing after a rather bleak 1936 season and concentrated on voiturettes. With the introduction of the 3-litre formula in 1938 the company made a comeback. The company had by now been taken over by the wealthy Italian industrialist Adolfo Orsi (who was mostly interested in acquiring Maserati's spark plug factory) and the Maserati brothers now got (limited) resources to build a real Grand Prix car again. The result was the Tipo 8CTF, a straight development of their 1.5-litre 4CM voiturette car. The car had an 8-cylinder in-line engine with double overhead camshafts based on two 1.5-litre voiturette units placed end to end. The engine had a volume of 2992cc (69x100mm) and with two Roots superchargers, each supporting four cylinders through a Memini twin-choke carburettor, it produced some 360bhp at 6000rpm. (The German cars produced some 420bhp at that time.) Transmission was via a four-speed gearbox in unit with the engine. The chassis was made of channel side members and followed the ideas from the Voiturettes but the wheelbase was longer (271cm). A cast aluminium oil tank served as chassis cross bracing. The front suspension was independent with transverse swinging links and torsion bars while the rear suspension featured quarter elliptic leaf springs. The brake system was hydraulic with 16" front drums and 14" rear drums. The body was a 10 percent enlarged variant of the Tipo 6CM voiturette. The car was a simple no-nonsense design and one of the most handsome of the era. Three 8CTF cars were built. Chassis 3030 and 3031 were used by the works team for the 1938 season. Weighing only 780kg, 200kg less than the contemporary Mercedes, the car proved to be one of the fastest in the field but also one of the least reliable. The New Maserati made its debut at the 1938 Tripoli GP raced by Achille Varzi and Count Trossi. Trossi showed the speed of the new design by taking an early lead and making the fastest lap of the race before having to retire with engine problems. Then the new Maserati wasn't seen until the next major race on Italian soil, Coppa Ciano on 7 August where two cars were entered for Trossi and Zehender. Trossi proved to be fastest in each practice session to take pole position. Zehender was an early retirement with engine troubles but the team hardly noticed that because on lap 4 Trossi, who had made a bad start, took his car up into the lead and started to open up a gap to Caracciola's Mercedes. For four laps the spectators cheered as the Italian car pulled away from the rest of the field. But that was too much for the Maserati engine and on lap 8 Trossi retired. At the Coppa Acerbo Trossi did a good race until he felt ill and handled over the Maserati to voiturette driver Luigi Villoresi. Villoresi made his debut as Grand Prix driver in style by setting full speed and he broke the lap record twice before he had to retire with engine failure. At the Italian GP Trossi took the car to its first finish, a fifth place, while Zehender and Villoresi retired. One car showed up for the Donington GP to be raced by Villoresi but it failed to show any speed and was an early retirement, once again with engine troubles. Unfortunately the budget did not permit a full GP season or the developments that would have made the car more reliable. The Maseratis were not seen again until the 1939 German GP. The 1939 German GP was held at Nürburgring on 23 July 1939. Along with Pietsch, Luigi Villoresi and Swiss Armand Hug were entered for a Maserati works drive, but one week before the race Hug had a serious crash practicing for the Albi GP that turned him permanently paralyzed. Auto Union entered no less than five cars for the race against four for Mercedes-Benz. Auto Union drivers included Nuvolari, Stuck, Müller, Hasse and Meier while the Mercedes cars were driven by Caracciola, Lang, von Brauchitsch and reserve driver Brendel. The only Alfa Romeo was Sommer's private 8-cylinder car. The Schells were there with their Delahayes for Dreyfus and "Raph" and Süddeutsche Renngemeinschaft with their silver-coloured Maseratis for Dipper and Joa. Mandirola's and Mazaud's private entries completed the field. Mercedes-Benz had worked hard to cure the engine problems that had occurred earlier in the season and were now confident that the cars would stand the whole distance. Mercedes driver Hermann Lang was in a class of his own finally beating even Rosemeyer's pole time from 1937 with a lap time of 9:43.1. 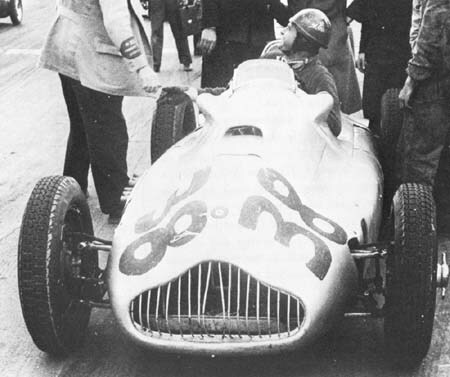 Von Brauchitsch and Caracciola completed an all-Mercedes front row. Pietsch with a time of 10:14.0 started on the third row and Villoresi with a time of 10:26.0 on the fifth row. Some 250,000 to 300,000 spectators turned up to what would be the last German GP for a considerable time. During practice the weather had been sunny but now the sky was gray with fog in the woods and drizzling rain on several places of the track. When the light turned to green von Brauchitsch made a perfect start to lead the field into the Südkehre followed by Stuck, Lang and Caracciola. But soon Lang took over the command and at the end of the first lap he had opened up an incredible 28-second lead. Villoresi was soon in the pit for new plugs but Pietsch in the sister car was really flying, passing car after car. Lang took the second lap a bit easier to open the lead to "only" 40 seconds. But on lap 3 Lang heard a noise in the engine and decided to retire to the pits rather than to have his engine destroyed. Von Brauchitsch also went into the pits for new plugs and suddenly, to the surprise of all, Pietsch's Maserati was leading the German GP. Korpsführer Hühnlein, who had warmly shaken hands with Pietsch before the start, was now less than amused. But the fun lasted less than a lap as Pietsch had brake problems and had to let Nuvolari past and make a pitstop for adjustments. Neubauer sent junior driver Brendel a signal to come in so that Lang could take over the car. But Brendel refused to obey and instead made a 10:28 lap, the fastest of the race so far. Just ahead of the Adenauer Brücke Pietsch's Maserati spun in front of Brendel and the Mercedes driver went into a ditch destroying the car, arousing Neubauer's anger. It was now raining all over the track and the cold created plug troubles for several cars including Meier's and Pietsch's. Nuvolari was leading from Müller and Caracciola in the sole remaining Mercedes as von Brauchitsch had retired, too. Caracciola soon advanced to second position, 5 seconds behind the leading Auto Union. Meanwhile Villoresi retired his Maserati with a split tank. For five laps Nuvolari led the race but then he had to make a one-minute stop for engine inspection leaving the lead to Caracciola. The order was now: Caracciola, Hasse, Müller, Nuvolari, Pietsch, Dreyfus, Meier, Joa, "Raph", Mazaud and Mandirola. Caracciola made a 1:23 minute pitstop for fuel, tyres and plugs on lap 9 falling back to third place. The Auto Union team made faster stops and now Hasse was leading Müller by 15 seconds, followed by Caracciola, Nuvolari, Pietsch, Meier and Dreyfus. The rain increased and the rain specialist Caracciola soon passed Müller for second place. The front stub axle broke on Meier's Auto Union and he had to retire. Caracciola also passed Hasse to take the lead and when Hasse tried to answer he went off the slippery track and had to retire leaving only two Auto Unions to challenge the Mercedes. Müller was now second, half a minute behind Caracciola, and Nuvolari a distant third suffering from engine problems. Pietsch had spun twice and had made four pit stops but the Maserati was still making good speed in fourth place. On lap 18 Caracciola made a short stop without losing his lead. Nuvolari's engine exploded in a spectacular way and Müller in the last remaining Auto Union also made a short stop for fuel. On the last laps Caracciola raced in dominant style, turning in the fastest lap of the race, and he took the flag to win the German GP for the sixth time. It was to be Caracciola's last victory. Müller finished second and Pietsch third despite his problems. In 1939 the works Maseratis were entered only for the German GP. The Schells had now however had enough of the Delahayes and the team immediately made arrangements for buying two works Maseratis instead. Lucy O'Reilly Schell entered them for the Swiss GP with Dreyfus and "Raph" as drivers and then went with them to USA in 1940 to be raced by Dreyfus and Le Begue. There the cars remained for a surprising second lease of life: racing in the Indy 500 until the 50s under a multitude of owners. Wilbur Shaw, who had bought chassis 3032, dominated the 1939 and 1940 Indy 500s and led the 1941 race until having to retire. Pietsch was asked to join Mercedes for the 1940 season but it would take until 1950 before he raced again. Racing Maseratis, Alfa Romeos and Veritas Meteors, Pietsch started in three GP championship races without receiving any points before retiring from driving and concentrating on publishing instead. In 1946 Paul Pietsch and a friend started a magazine called Das Auto before he became a major publisher of motor and racing books and magazines in central Europe, under the banner of Motorbuch Verlag. The widely respected Auto Motor und Sport magazine, today running as strong as ever, is one of Pietsch's best-known creations. This picture shows the finest moment of Pietsch's career, the first real threat to Mercedes and Auto Union supremacy since the Nuvolari days in 1935 and 1936 (if the Dreyfus/Delahaye victory over Lang and Caracciola in the minor 1938 Pau Grand Prix is neglected). Maserati, as always suffering from the lack of finance, followed their usual philosophy of giving works support to private entrants rather than concentrating on the works team and so Pietsch, who had showed some fine performances in his works-backed Maserati 4CM and 6CM voiturette cars, was "invited" for his 1939 home Grand Prix to back up regular works driver Luigi Villoresi. If the factory had been able to afford a more serious engagement and a true development programme (especially to improve the usual poor reliability of their cars), maybe the 8CTF could have proved that it had the potential perhaps to be even a challenger for the Germany cars. But at least it was good enough to enable Pietsch's moment of glory in Grand Prix history when he was the surprise leader of the race at the end of the second lap. And this in a red Maserati in the country of the silver arrows! Even though he was passed on the next lap by the Auto Unions of Nuvolari and Müller and also by Caracciola's Mercedes and despite he also had two spins later in the race Pietsch drove exceptionally well and had he not lost more than six minutes during four pit-stops he could have well been at the heels of race winner Caracciola and second placed Müller (the sole remaining German cars) at the end of the race. But so he had to be content with an excellent third position albeit one lap down. After the race the two 8CTFs were sold to France to the Schell family's private Ecurie Bleue which entered them again in the Swiss Grand Prix but their performance there was not nearly as good as that of Pietsch at the Nürburgring. Unfortunately the outbreak of the war prevented Maserati and also Pietsch from scoring any real success in Grand Prix racing for the time being. This was achieved only in the US where Wilbur Shaw's 8CTF had already won this year´s Indy 500 and would do it again in 1940. Pietsch's biography is also very interesting. It starts with the affair between his wife Ilse and Achille Varzi in 1935 when Pietsch was in the Auto-Union team as a reserve driver (and she was also the person who introduced Achille to drugs after the scandal of the 1936 Tripoli race which was said to have been "fixed" in favour of Varzi for political reasons). In the following years Pietsch had the status of a Maserati semi-works driver in voiturette races during the late thirties where he showed some impressive performances without having any really countable success. After the war he of course soon got involved in the local scene again as Germany was banned from international racing until 1950. He won the 1951 Eifelrennen (a Formula 2 race) in his Veritas Meteor and he was even invited into the all-conquering Alfa Romeo team for his home Grand Prix in the same year. In that race, after initially lying in fifth position, he had a heavy shunt, the same happened again when he was back again in the cockpit of his Veritas in the Avus race in 1952. After this experience he preferred to concentrate on his publishing business. Until today he remains Germany's most successful publisher of motor and motorsports literature and he also wrote an autobiography under the title "Doppelsieg".